On November 10, 2017, was published the Emergency Ordinance 79/2017 on the amendment of the Fiscal Code. A new chapter has been introduced – Rules against tax avoidance practices that directly affect the functioning of the internal market, rules transposing the provisions of Council Directive (EU) 2016/1164/ of 12 July 2016, laying down rules against evasion which have a direct incidence on the functioning of the internal market. Limitation of interest deductibility and other costs equivalent to interest from an economic point of view. Thus, it will be possible to deduct expenses with the debit within the limit of 10% of the calculation base, but not more than EUR 200,000 in a fiscal period. For the transfer of assets, tax residence and/or economic activity carried out through a permanent establishment for which Romania loses the right to tax, taxpayers will be subject to corporation tax. The tax base will be determined as the difference between the market value of the assets transferred and their tax value. The general anti-abuse rule. It provides that, for the calculation of tax obligations, no action or a series of steps is considered if all relevant facts and circumstances are not honest. Rules on controlled foreign companies. These rules provide that the undistributed income of foreign controlled companies should also be taken into account when calculating the corporate tax. A foreign controlled company is considered to be an entity that is held directly or indirectly by more than 50% by the taxpayer. 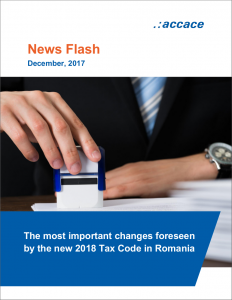 The ceiling to which Romanian legal entities are required to pay this tax has been raised from EUR 500,000 to EUR 1,000,000. Restrictions regarding the eligibility of legal entities to apply this tax system have been lifted. Thus, income from consultancy and management (in any proportion) is no longer a limitation for the application of this tax system. Also, restrictions on the application of this tax have been imposed on companies in the following areas: banking, insurance, gambling, petroleum and natural gas exploitation, and are eligible for this tax system (provided that the income is below EUR 1,000,000/year). It was eliminated the possibility to opt for the payment of the profit tax in case the social capital exceeds RON 45,000. Tax rates remained unchanged: 1% (if employees) or 3% (without employees) applied to the volume of income. The tax rate was reduced from 16% to 10% for the following income categories: independent activities, wages and salary assimilation, disposing of goods, investments, pensions, agricultural activities, forestry and fish farming, prizes, and other sources. For Intellectual Property Income, the applicable tax rate is reduced to 7%, the previous quota being 10%. For taxpayers who earn monthly gross earnings from salaries ranging from RON 1,951 to RON 3,600, the personal deductions are degressive in relation to the above and are set according to a table provided in the Fiscal Code. 8% due to special labor conditions by natural and legal persons who are employers or are assimilated to them. Therefore, for salary income, the employee’s contribution share at CAS will be 25% (previously 10.5%), and for the employer will be 4% or 8%, depending on the working conditions (previously was 15.8%). For individuals who earn income from independent activities, the monthly CAS calculation base will be the income chosen by the taxpayer, which cannot be lower than the minimum gross national salary in force in the month for which the contribution is due. The contribution will be due only if the net income realized in the previous year, related to the number of months of activity during the year, will be at least equal to the minimum gross salary per country in force in January of the year for which the contribution is established. Otherwise, the person can opt for CAS payment (not required). The CASS share is 10% and is due to individuals who have the quality of employees or for which CASS is required to be paid. CASS previously owed by the employer of 5.2% was eliminated. For individuals who earn income from self-employment, CASS’s monthly base will be the level of the country’s minimum gross salary in force in the month for which the contribution is due. The contribution will be due only if the net income realized in the previous year, related to the number of months of activity during the year, will be at least equal to the minimum gross salary per country in force in January of the year for which the contribution is established. Otherwise, the person can opt for CASS payment (not required). Employers will owe the insurance contribution to work for salary earnings paid to employees. The share of the insurance contribution for work is 2.25%. The monthly base for calculating the insurable labor contribution is the sum of gross income from wages and income assimilated to salaries. A provision has been introduced that the competent tax authorities have the right to refuse VAT deduction if, after administering the evidence provided by law, they can undoubtedly prove that the taxable person knew or ought to have known that the transaction invoked for justifying the right to deduct was involved in a VAT fraud that occurred upstream or downstream of the supply chain. The measure of confiscation of the oil tanks, containers and means of transport used in the transport of excisable products and the situation of possession outside the fiscal warehouse or the sale on the territory of Romania of the excisable products subject to the marking, without being marked or badly marked or with false markings, has been extended. The tax for transport vehicles with a mass of more than 12 tons was increased. THE PROVISIONS OF EMERGENCY ORDINANCE 79/2017 WILL COME INTO FORCE ON 1 JANUARY 2018.